Vegetables constitute an important source of income and food for all types of households, and are grown by some 600,000 farmers in the North. 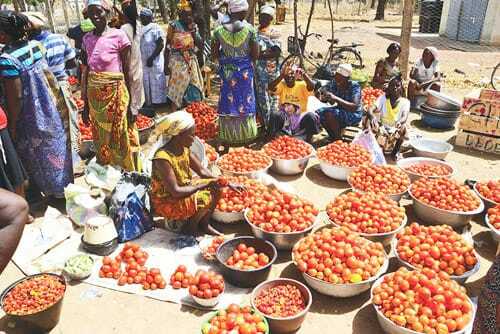 Women of poorer households grow vegetables in their market gardens as a source of ingredients for soup, selling whatever excess they have left over for cash. Better off, more commercially orientated farmers, based around the major irrigation schemes (e.g. Tono, Vea and Bontanga) grow vegetables as a cash crop in the dry season to augment incomes from their main rainy season crop. Of the crops grown by a substantial proportion of Northern farmers, vegetables produce the highest income per hectare. However, growing vegetables profitably requires fertile land, a substantial outlay on inputs, including labour for establishing nurseries, transplanting and harvesting. The average plot devoted to the commercial production of vegetables is very small. The incomes from these small plots, especially during the dry season, are vital in livelihood strategies. Improve farmers access to and use of improved varieties of vegetable seeds and inputs. Our market screening highlighted the limited adoption of improved vegetable seed varieties by smallholder farmers in the North. This is due to a number of factors including the inability of public research institutions to develop effective partnerships with the private sector to commercialise the findings of their research on improved varieties. In addition the public extension systems has failed to deliver information to farmers on the benefits of using improved seed and the practices required to maximise yields from these varieties. MADE is actively facilitating partnerships between the public sector (particularly the extension service) and private seed suppliers to both increase farmers knowledge of and access to improved vegetable seed varieties. This involves increasing their capacity to work together to organise and effectively manage demonstrations to showcase improved onion varieties and to disseminate information on good agricultural practices. MADE is also actively promoting commercial supply relationships between major international seed suppliers and local input dealers on the ground in the North. Improve the vegetable supply chain in northern Ghana. The strengthening of the supply chain between vegetable farmers and end-buyers is required to incentivise farmers to invest in and adopt improved production technologies (seed and inputs). Currently a combination of coordination failures and infrastructural weaknesses along the value chain reduces the farmers incentive to invest in these improved technologies. 1,307 men and 633 female smallholder farmers exposed to improved varieties and GAP, with early indications of 25% adoption rates. 468 smallholder farmers who participated in the demonstrations purchased improved seed varieties in just one quarter.